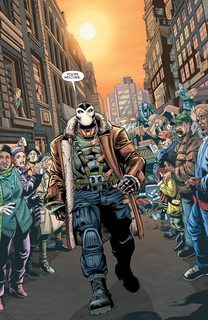 When the Arkham War ended, Bane was the clear victor, but his reign over Gotham proves to be a short lived one in Forever Evil Aftermath: Batman vs. Bane, a one-shot epilogue to the Arkham War mini-series and Forever Evil itself. Oh, and in case you’re confused, no… no, Forever Evil still hasn’t had its last issue yet. In what appears to be days or perhaps mere hours after claiming Gotham as his own, Bane discovers that the power is back on and that’s not all. Radios are functional and they say that the military are on their way, all bridges to the island are being rebuilt, and even the cable television is working again so folks can catch up on their DVR (not a random example, it happens in the comic). You’d think this might be a good time for Gothamites to really celebrate, I mean they play a big part in this issue despite being absent during the actual war (their presence during the main saga would’ve added some heft to all that action) but they’re all just kind of like “Oh, okay.” It’s clear that Gothamites are used to the ebb and flow of their city’s destruction and reformation. Perhaps they view announcements about escaped Arkham inmates the same way we react to forecasts for rain. 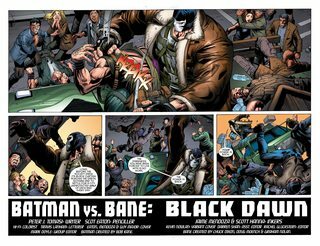 If all you’re looking for are some cool pictures of Batman and Bane brawling then this is going to satisfy. There are a few notable splash pages here, but more often than not the idea behind the action is better than its execution. For instance, there’s a scene where the Batmobile crashes through a truck to take out a Talon (they are taken down REALLY easily, by the way. Everybody is. Batman’s rescue of Gotham plays out with all the drama and suspense of watching someone dust-off their furniture after returning home from a week-long vacation). Sounds awesome, but the perspective is so tight that we lose a lot of context and there’s a lack of detail and a certain cleanliness to the impact that makes it seem tame and ultimately forgettable. 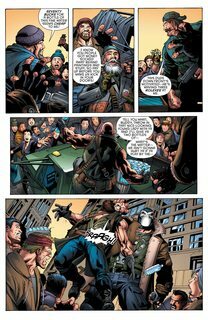 It’s a problem that happens during the Bane vs. Batman fight as well. We’re so close-up with the punches that there’s no sense of the space they’re fighting in. There was also a scene with a little boy who looked like a small child in one panel and a teenager in the next, but that’s easily overlooked because Bane looks so cool in the very same moment.While the cover may show Bat-Bane, he’s nowhere to be found in this issue. I imagine someone at DC noticed how everyone was making fun of “Bat-Bane” and decided to cancel all future plans for that character design and go with the more crowd-pleasing Dark Knight Rises look. It definitely is The Dark Knight Rises too. Everything from the neck down, anyway. Comic Bane still does not wear the sleep apnea mask from the film.